How much is your Montreal home worth? Thinking of selling your property? Montreal’s housing market has been growing significantly. Simply fill out a short form, and find out what it is worth today. Find out the value of your property, right here. What email address should we send your brochure to? Which neighbourhood is your property located in? Ex. in-ground pool, recently renovated, newly built, etc. 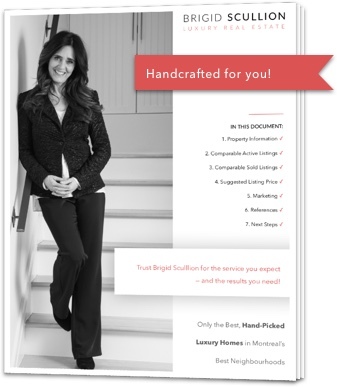 An unparalleled listing assessment tool — only available from Brigid. With Montreal’s real estate market quickly heating up this fall, there has been no better time to sell. Take advantage of a strong seller’s market to secure the best price for your property. Curious how your property stacks up against other listings on the market? No problem. We’ll simply ask you just a few questions and schedule a quick call to get to know your timeline and objectives. Then, we’ll prepare your personalized seller’s brochure, full of valuable, up-to-date, local housing market insight, marketing strategies and of course: the recommended asking price for your property. Ask for your brochure today — available exclusively from Brigid. What is Brigid’s Personalized, "Seller’s Property Brochure and Assessment"? Brigid’s Seller’s Brochures are not some automated home pricing emailing list that other high-volume agents use to generate leads. Instead, each brochure reflects the unique characters and properties of your home, and are handcrafted based on up-to-date research into market conditions, comparable listings, existing competition in your neighborhood and historical price changes. You will find valuable suggestions for marketing and staging your home successfully, and even references from past clients. When you’re looking for that genuine, local market expertise and properties that are exclusive and distinct, Brigid is the real-estate guide for you. With her help, you will not have to deal with the time-consuming and daunting process of listing, marketing, scheduling visits and waiting ages for your home to sell at the best price in this competitive market. Entrust your property sale to Brigid and you get the exclusive one-on-one service you deserve – and the results you expect. This is the secret to why she has sold every property she has listed. The brochure is an absolutely free of charge tool offered to qualified sellers* in Montreal. Start by filling out the request form. At the end of it, you’ll schedule a 5 minutes call to confirm certain details. Then, we will begin preparing your brochure. You can generally expect to receive it via email within a few business days. How do Brigid's clients review their experience after working with her? Brigid’s clients know that she offers the best representation throughout the various stages of buying or selling their home. "Our experience working with Brigid is that she is absolutely exceptional at her job. Her enthusiasm, energy, work ethic and interest in real estate set her apart from other brokers we have worked with in the past. She is always willing to show the listing, take a call, or return an email. There is no middle man when working with Brigid. She represents you and your property 100%. Looking forward to the next opportunity to work together." - H. Simpson & C. Millen, Sellers for 1280 Pins O.
I had the good fortune of working with Brigid Scullion for the sale of my Townhouse on Redpath Place. She gave us her full attention and made a 100% effort to understand the Buyers needs as well as my own. Brigid displayed great patience and creative problem solving to arrive at a mutually satisfying agreement. - Helen Frank B.S.W, M.S. "Every time I speak with my new tenants, I realize that engaging the services of Brigid Scullion as my broker was the best move I could have made. She listened to what my needs were and made things happen extremely fast. Efficient, results oriented, attentive to every detail, always positive and above all, someone who really has a passion for what she does. I will continue to use her and would recommend her to anyone that is looking to buy, sell or rent a property". Connect with Brigid for buying and selling tips as well as insight into Montreal’s best neighbourhoods!